The Pets are Dream Eater Spirits that appear in Kingdom Hearts Union χ. While Player's own Pet can be assembled from various Spirit Parts into all sorts of hybrid designs, the assorted Parts of a specific "species" of Pet are usually made available at the same time. Following the events of the Keyblade War, the new Union leaders, Ephemer, Skuld, Ventus, Brain, and Lauriam, decide to celebrate by providing new Spirits for the Dandelions. Ephemer goes with Skuld and Ventus to collect the necessary ingredients, while Brain and Lauriam stay behind in order to prepare. Quest 735: The Shiny Hammer Pt. 5 Soon after, a Chirithy approaches Player and, using some of Player's Chirithy's fur, creates a "pet" for them. The Kitstar (ネコスター, Nekosutā?) is a Pet based on a cat[which?] that comes in Blue, Pink, and Rainbow varieties. The Blue and Pink varieties were available as part of the default options in the Pet System. Kitstars have a plethora of stars decorating their bodies, including a large star on their forehead, small stars scattered throughout its mane, and four stars toward the base of its tail. Additionally, Kitstars have white fur covering their muzzles, the lower halves of their legs, and the tips of their ears. The Rainbow variant has a shiny star on its forehead and color gradations to its collar and tail. The Pupstar (イヌスター, Inusutā?) is a Pet based on a dog[which?] that comes in Blue, Pink, and Rainbow varieties. The Blue and Pink varieties were available as part of the default options in the Pet System. Pupstars have a plethora of stars decorating their bodies, including a large star on their forehead, small stars scattered throughout its mane, two larger stars situated within its tail, and a falling star at the out edge of its tail. The Rainbow variant has a shiny star on its forehead and color gradations to its collar and tail. The Bunstar (ウサスター, Usasutā?) is a Pet based on a rabbit[which?] that comes in Blue, Pink, and Rainbow varieties. Bunstars have a plethora of stars decorating their bodies, including a large star on their forehead, small stars scattered throughout its mane, tail, and the tufts of its ears. Additional white fur is formed around the Dream Eater's ankles and cheeks, covering its muzzle. The Rainbow variant has a shiny star on its forehead and color gradations to its collar, tail, and ear tufts. The Pigstar (ブースター, Būsutā?) is a Pet based on a pig[which?] that comes in Purple, Yellow, and Black varieties. Pigstars have a plethora of stars decorating their bodies, including a large star on their forehead, small multi-colored stars scattered across its back, and a large star at the end of its tail. The Black variant has a shiny star on its forehead, golden stars on its rump, and a larger star on its tail. The Reinstar (トナスター, Tonasutā?) is a Pet based on a reindeer[which?] that comes in Blue, Green, and Gold varieties. Reinstars have a plethora of stars decorating their bodies, including small stars scattered throughout its mane, antlers, and two small stars situated within its irises. They have red noses, and white fur covers the their muzzle, cheeks, ears, and lower legs. The Gold variant has a shiny star on its forehead, and beaded garlands with Christmas ornaments around its antlers and collar. The Pupmoon (イヌムーン, Inumūn?) is a Pet based on a shiba inu dog that comes in Orange, Blue and Black varieties. Pupmoons have a yellow crescent moon on their foreheads. There are also three stars of various shapes placed about their body: a small star towards the center of their body, a medium-sized star directly above the smaller star, and a larger star on their left ear. The fur on their tail, paws, chest, and underbelly are white. The Hamstar (ハムスター, Hamusutā?) is a Pet based on a hamster[which?] that comes in a Chocolate variety. The Chocolate variety was available in Japan alongside the Heart Sunglasses as part of February 2018's Limited Missions. Hamstars have a plethora of stars decorating their bodies, including a large star on their forehead, small stars scattered throughout its mane, as well as decorating its chest and back. The Monstar (モンスター, Monsutā?) is a Pet based on a monkey[which?] that comes in a Pink variety. The Pink variety was available in Japan alongside the Rose Flower Petals as part of March 2018's Limited Missions. Monstars are covered in fur from head to toe, save for their faces, underbelly, and paws, with white fur making up their mane and the tip of their tail. This white fur is decorated with a plethora of stars, alongside a large star on their forehead. The Lambstar (ラムスター, Ramusutā?) is a Pet based on a lamb[which?] that comes in a Gray variety. The Gray variety was available alongside the Sleep Mask as part of April 2018's Limited Missions. Lambstars are covered in a thick grey wool from head to toe, save for their faces and the base of their tails, which are black. They have long faces with short faces and wide red, their wool is shaved into a rounded style on both the Lambstars's head and tail, and their backs are decorated with three small stars that compliment the larger star on the Lambstars's foreheads. The Foxstar (フォックスター, Fokkusutā?) is a Pet based on a fox[which?] that comes in a Red variety. The Red variety was available alongside the Red Sunglasses as part of May 2018's Limited Missions. Foxstars are covered in red fur from head to toe, save for their white underbelly, lower half of their face, and the tips of their tails, and the black tips of their ears and feet. They have long faces with small noses and thin eyes, two forward-facing ears on top of their head, and their backs are decorated with three small stars that compliment the larger star on the Foxstars's foreheads. The Horstar is a Pet based on a horse[which?] that comes in a Brown variety. The Brown variety was available as part of June 2018's Limited Missions. Horstars have a plethora of stars decorating their bodies, for which their earn their namesake, including a large star on their foreheads, and small stars scattered along its back. The Horstar has short brown fur covering its body, with darker brown hair making up its mane and tail. The Horstar also has dark brown hooves, large gray eyes and a short white snout. The Tortoistar is a Pet based on a tortoise[which?] that comes in an Orange variety. The Orange variety was available as part of July 2018's Limited Missions. Tortoistars have a plethora of stars decorating their bodies, for which they earn their namesake, including a large star on their forehead, small stars scattered across its shell. Tortoistars have skin that is a pale orange color, with brown shells, a while underbelly, small black eyes, and a beaked mouth. The Otterstar is a Pet based on an otter[which?] that comes in an Orange variety. The Orange variety was available as part of August 2018's Limited Missions. Otterstars have a plethora of stars decorating their bodies, for which they earn their namesake, including a large star on their foreheads, and small stars scattered along its back. The Otterstar has short orange fur covering the vast majority of its body, with white fur covering its mane and underbelly, as well as a thicker white fur making up its mane. It has small black eyes, rosy cheeks, and small ears with brown fur on the interior, with this brown fur also covering the Otterstar's feet and the end of its tail. The Giraffestar is a Pet based on an giraffe[which?] that comes in a Yellow variety. The Yellow variety was available as part of September 2018's Limited Missions. Giraffestars have a plethora of tiny stars decorating their bodies, for which they earn their namesake, including a large star on their forehead and a star-shaped blue end to its tail. The Giraffestar also has a blue mane running down the back of its neck, fluffy blue fur encircling its ankles and topping their horns, as well as encompassing its star-shaped tail. As well, the Giraffestar has a white snout, emerald green eyes, long eyelashes, and shell-shaped ears. The Flowerkit is a Pet based on a cat[which?] that comes in a Black variety. The Black variety was available as part of October 2018's Limited Missions. Flowerkits have a plethora of tiny stars along their back, as well as a purple flower adorning their foreheads, for which they earn their namesake, as well as big yellow eyes and sleek black fur. The Chameleostar is a Pet based on a chameleon[which?] that comes in a Pink variety. The Pink variety was available as part of November 2018's Limited Missions. Chameleostars are covered in pink scales from head to toe, with darker pink, purle, and blue scales making up its mane, small stars scattered across its back, and a large star on its forehead, for which it earns its namesake. 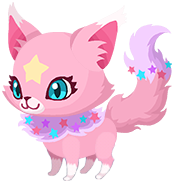 The Snowpup is a Pet based on a shiba inu dog that comes in Purple and Silver varieties. Pupmoons have a large snowflake on their foreheads. There are also three stars of various shapes placed about their body: a small star towards the center of their body, a medium-sized star directly above the smaller star, and a larger star on their left ear. The fur on their tail, paws, chest, and underbelly are white. The Silver variant also has a plethora of smaller stars and snowflakes in their tail. The Snowcub is a Pet based on a bear that comes in a White variety. Snowcubs have a large Star on their foreheads, with two smaller gray stars in their ears. Around their necks is a collar of interchanging pink and blue triangles, each pointed with a small star of either brown, beige, or gold, with three additional stars on their tails. The Coonstar' is a Pet based on a tanuki that comes in a Yellow variety. Coonstars have a large star on their foreheads with additional smaller pink and green stars in their manes. They are predominantly yellow with brown fur tipping their tails, around their eyes and snout, and covering their ears, chest, front legs and lower back legs, and white fur in on their snout, mane, and inside their ears. This page was last edited on 7 April 2019, at 08:26.